I was so focused on what needed to be done, that I didn't notice beauty right in front of me! that I don't see God's blessings. and of course we were blessed just to see it! 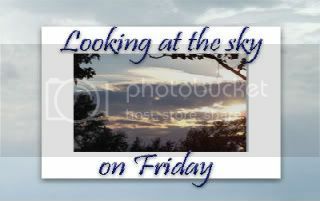 Visit Looking at the Sky or skywatch to see other pictures. God does good work indeed. Outstanding capture. You're so right. We live such a fast-paced life that we miss God all the time. Whether it's a beautiful sky or the soft words of a friend, or the smile of a stranger. This is a wonderful reminder. I caught a sky like that a few weeks ago...it really makes you lose your breath for a few moments...I am glad that you eventually focused on this God given reminder to slow down...beautiful capture. Thanks for sharing this with us. Happy Friday!!! Sometimes all you have to do is stop, look, and listen. Great Photos! I love seeing the sun's rays pouring down through the clouds. It makes me feel blessed, too.